View of the Chicken Shack and birds. We raise a different breed of meat birds compared to most people. We enjoy raising a breed called Freedom Rangers or Red Rangers. They are the same breed, however, they are referred to by both names. We like them because they truly "free-range". 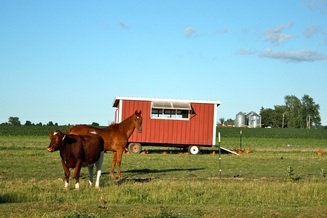 We don't put them in a movable cage, they get to come and go as they please and wonder through the pasture, however, they typically don't go too far from their movable home on wheels. We call this home of theirs the Chicken Shack. They get their grain, water and shelter from in or around the shack. Thankfully for our amazing dogs, they help to make this all possible by keeping the birds safe from predators. Just like our laying hens, we grind our own chicken feed for the meat birds. It is however a much greater challenge to feed these guys compared to the layers. These birds take 11-12 weeks to finish where the typical hybrid meat bird only takes 6-8 weeks to finish. The end result is what we feel to be a much healthier product and one that we can be proud of but it is also a more costly product when it's all finished. J.T. 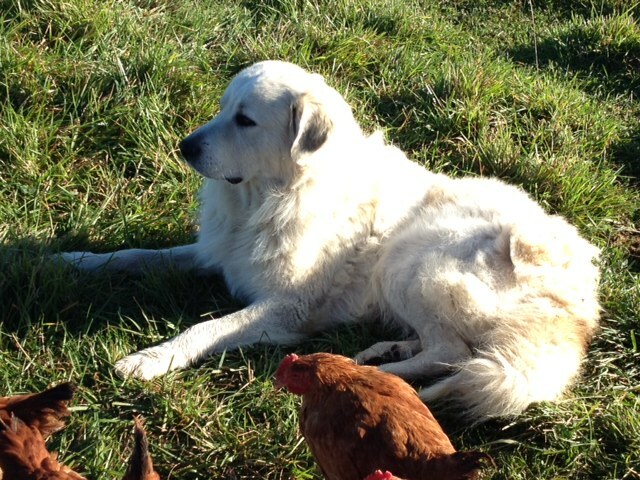 watching over the meat birds while I do chores.